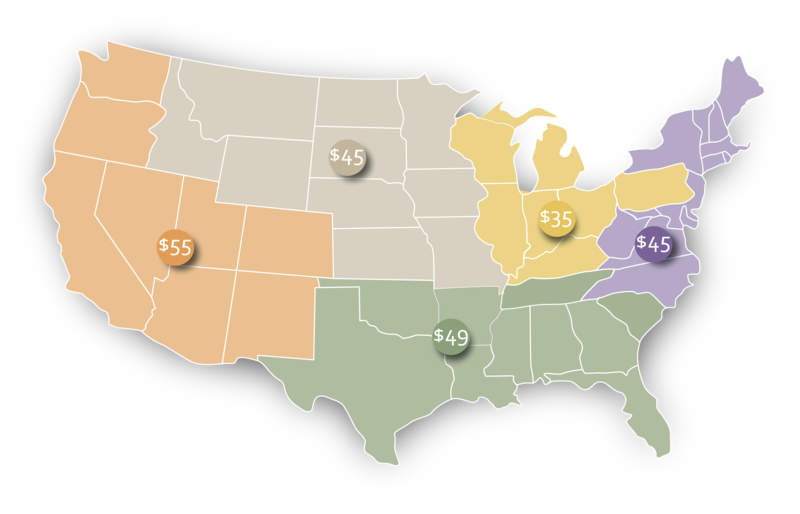 - All Continental U.S. orders/shipments qualify for our Flat Rate Program. - Cannot be combined with special distributor pricing. - A 25% freight cap will be offered for orders within Alaska, Hawaii, and Canada. - All other International orders will be dealt with on a case by case basis. We send batches of orders down to our warehouse every day before 2 p.m. EST. If you get your order in before 10 am EST, you can expect your order to go out in that day's batch. Orders in after 2 p.m. will be sent to our warehouse the following day. After an order arrives at our warehouse, it will be sent out to you in the approximately 2-3 business days. Our rush order fee is $15 per order. *If a rush order is less than 10 sku's and is sent to us before 11 am EST, it will be sent out that day. Any other rush orders sent after 11 am and before 3 pm will be sent out the following day. We ship from Seymour, Indiana. Please see the map below for estimated delivery times from our warehouse.